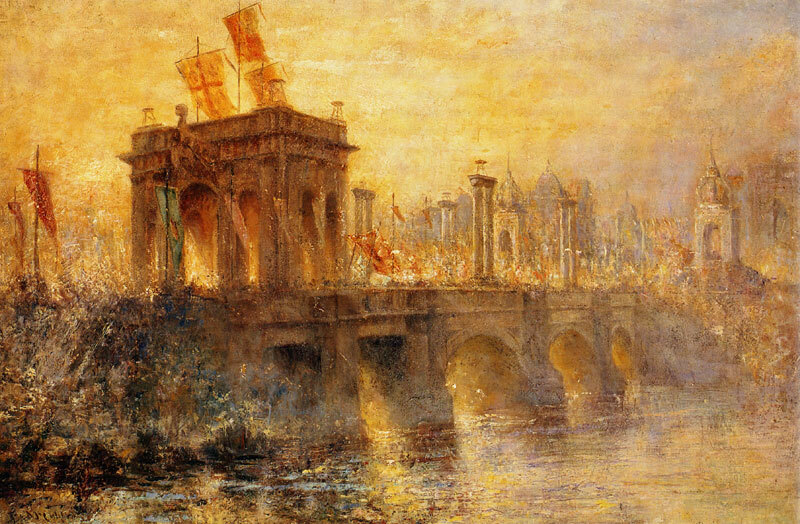 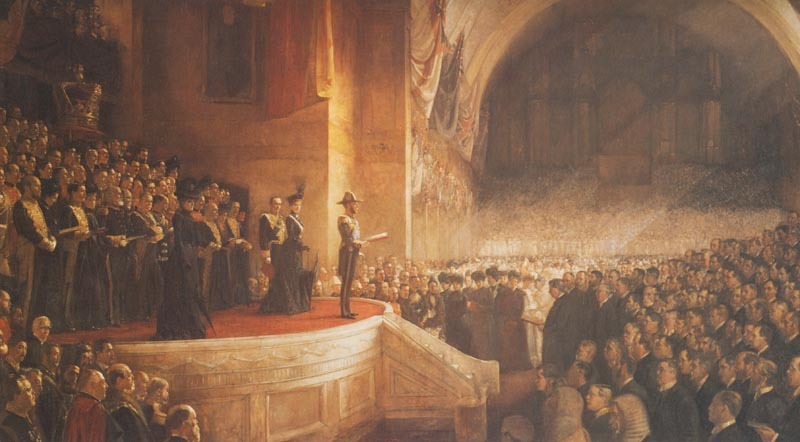 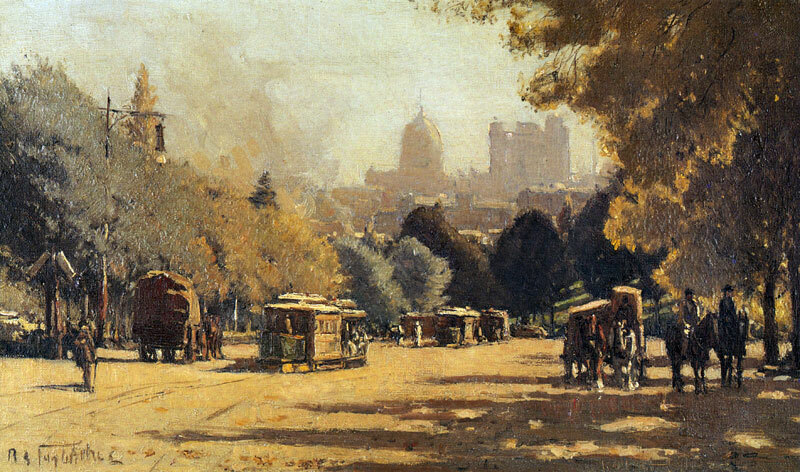 Tom Roberts’ commission to paint the opening of federal parliament was the largest he ever received. 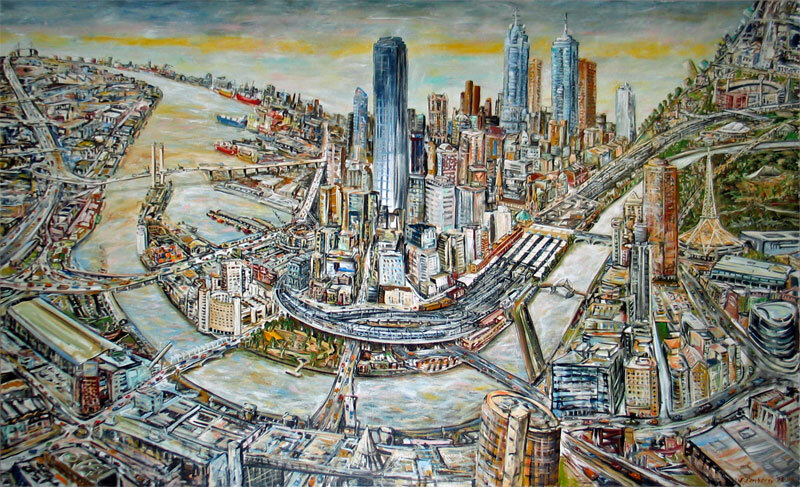 His painting has become an Australian national symbol. 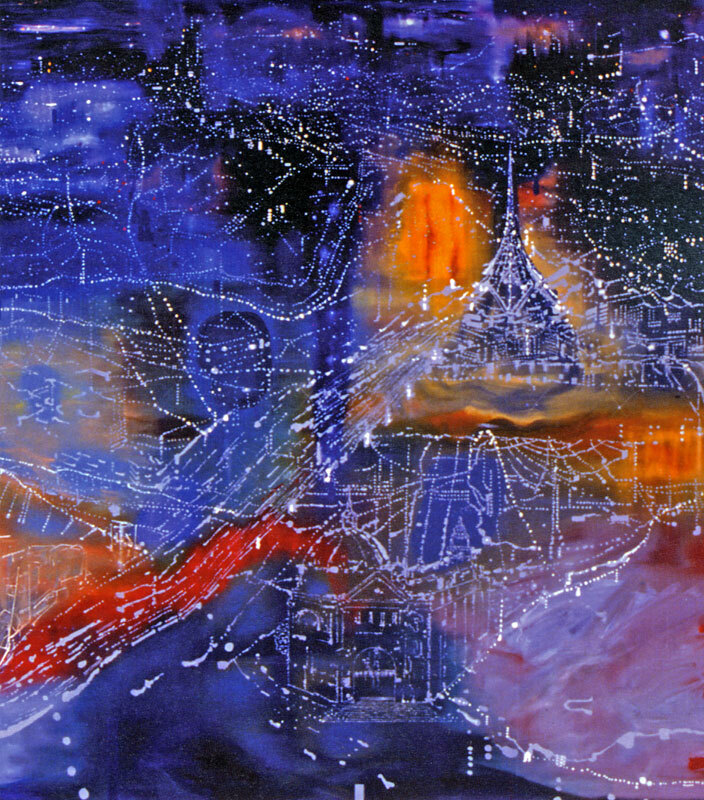 He has depicted the scene in the REB from an imaginary vantage point in the eastern transept. 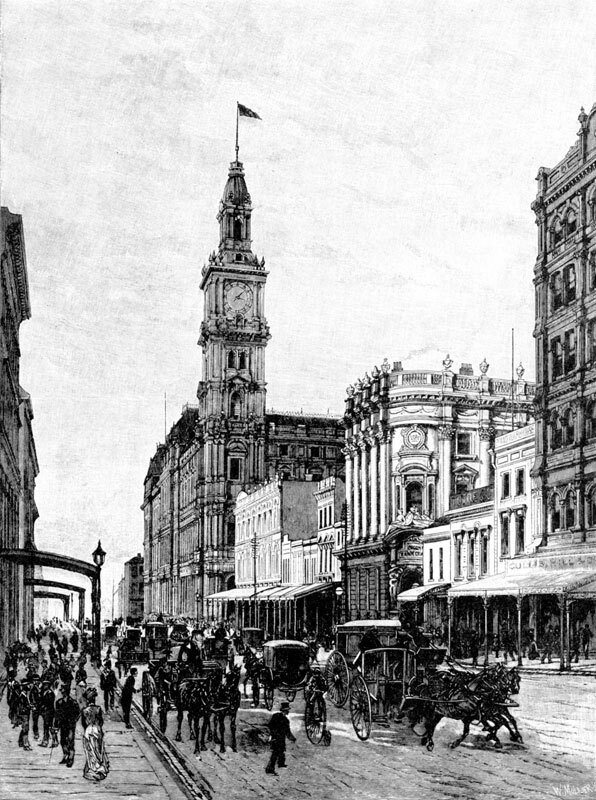 The dome you see in the centre is the REB and the building on the right is Parliament House. 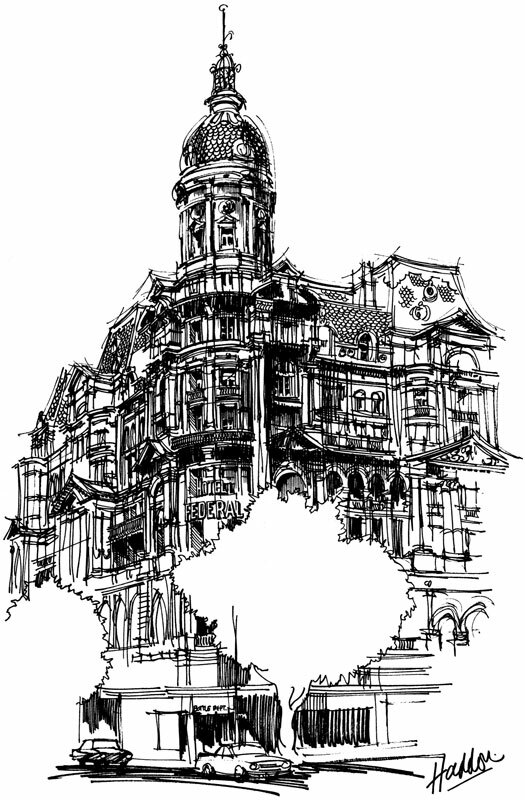 How cool does this look. 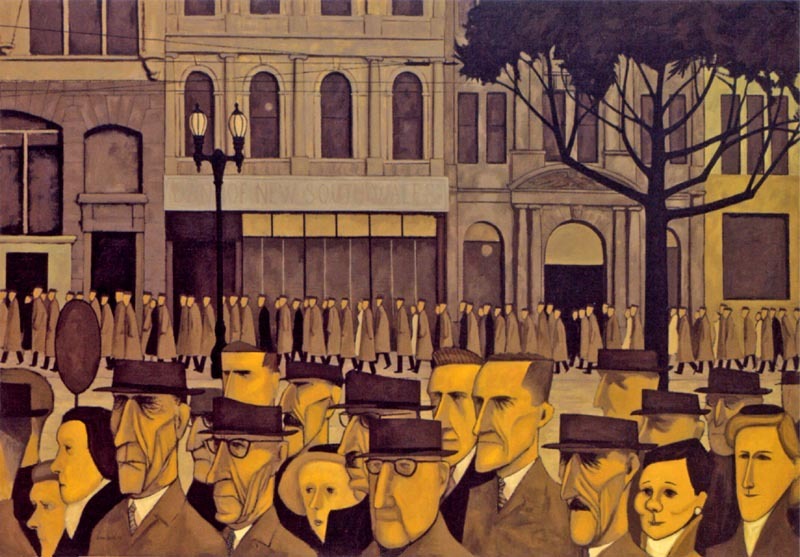 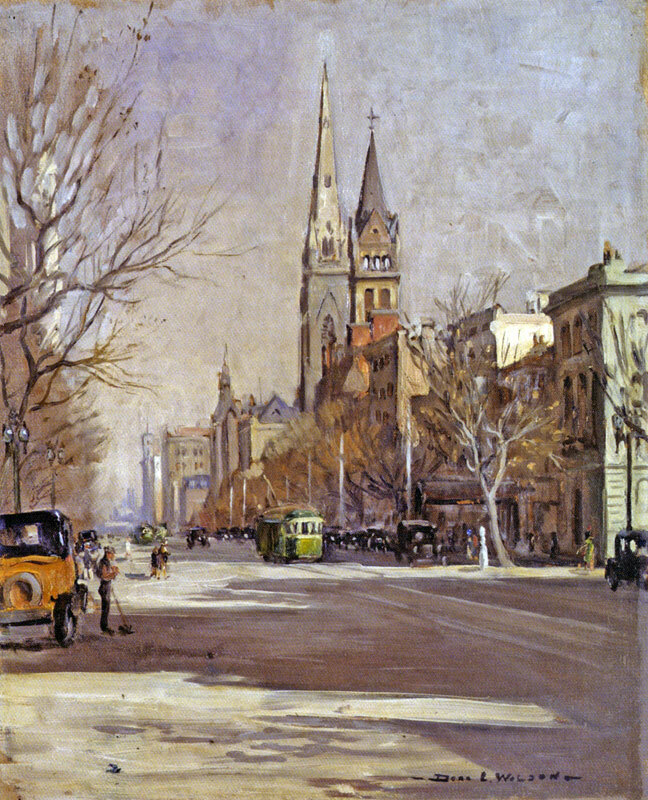 One of my favourite Australian paintings. 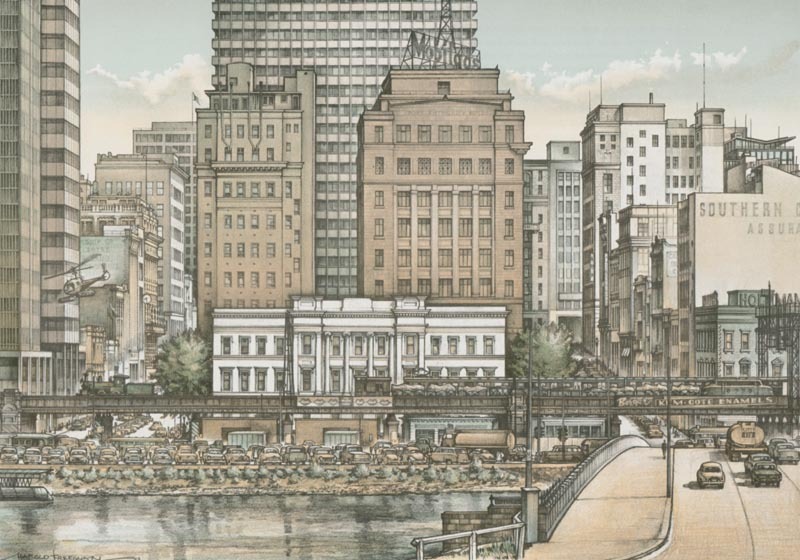 I love playing spot and name the buildings in these two panels above and below. 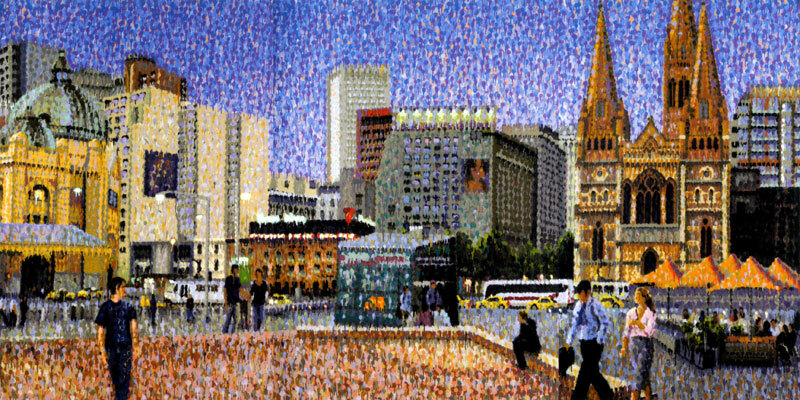 All three panels of the triptych can be viewed at NGV Australia, Federation Square. 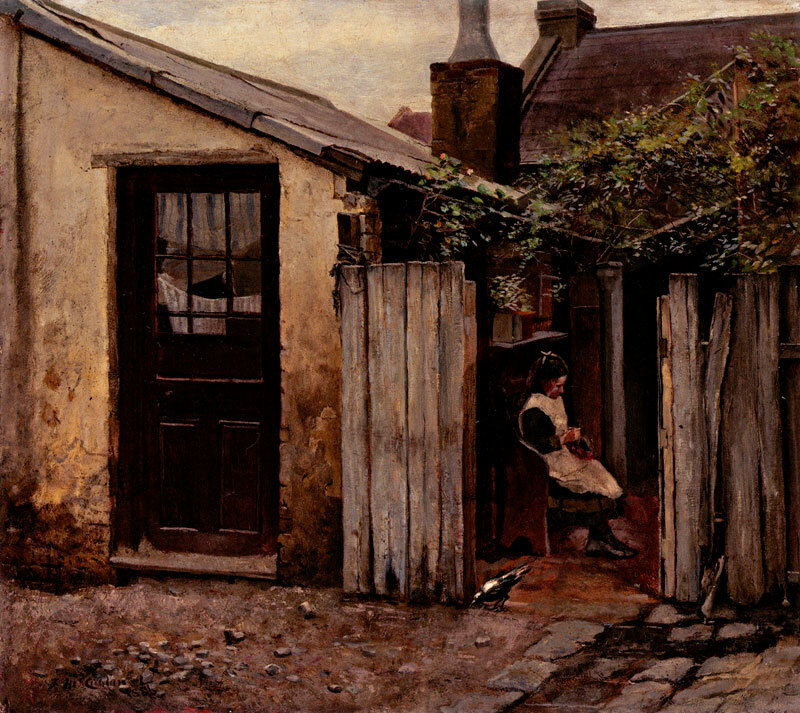 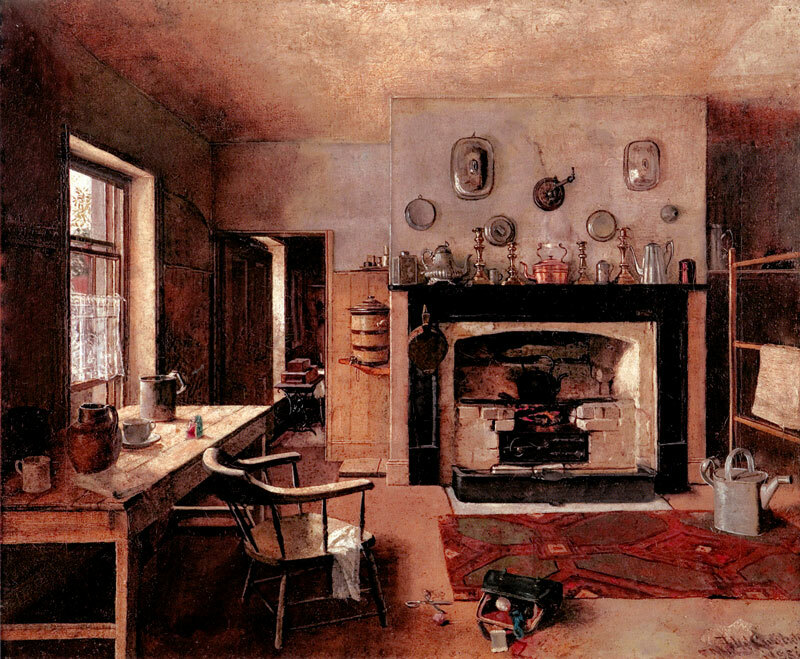 The two paintings below are of Frederick McCubbin’s father’s bakery at 165 King Street. 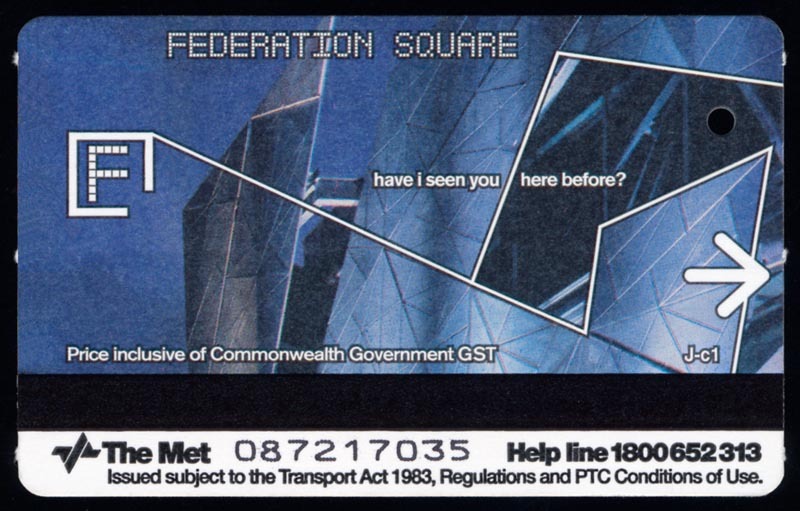 Remind me of something I once saw at Beechworth. 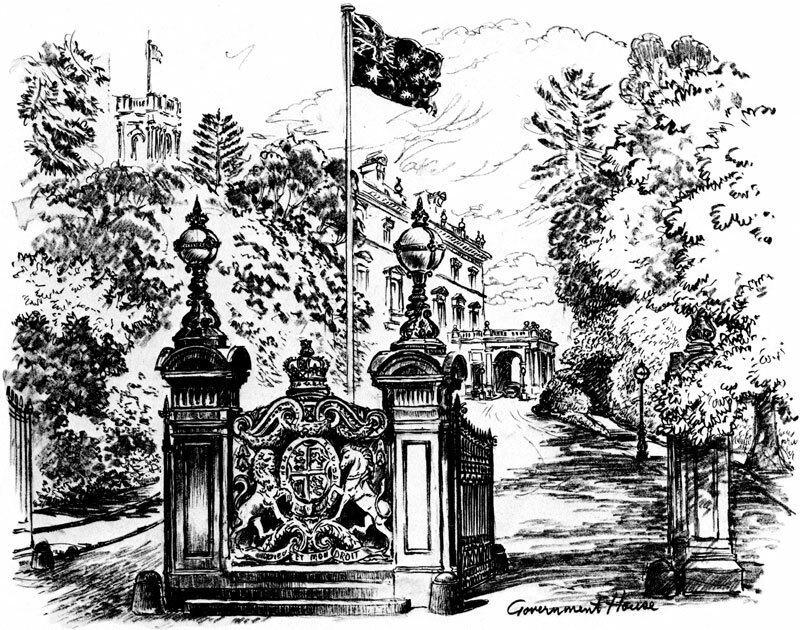 The ten sketches below are scanned from the book Historical Sketch of Victoria which is a facsimile extract from Picturesque Atlas of Australasia, first published in 1886. 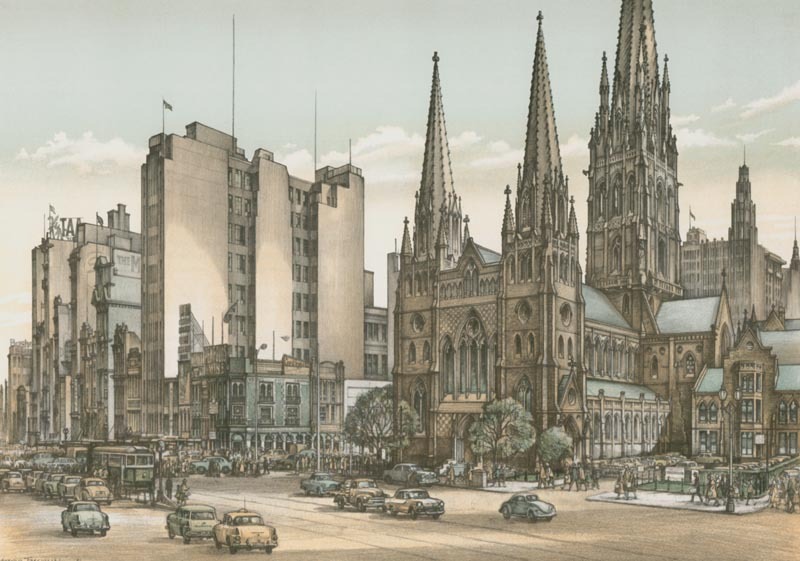 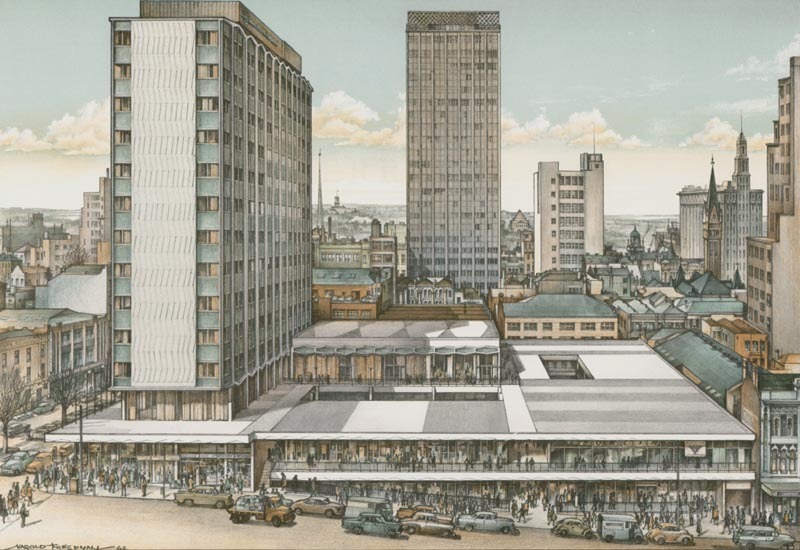 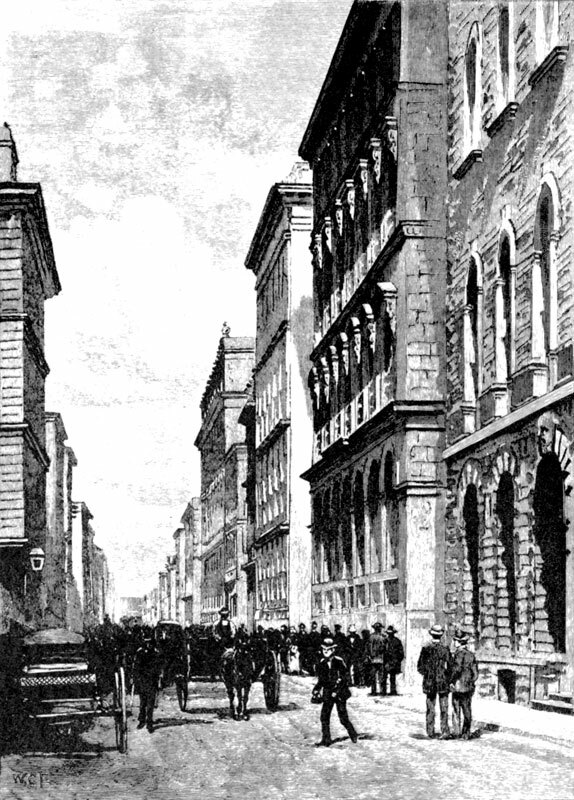 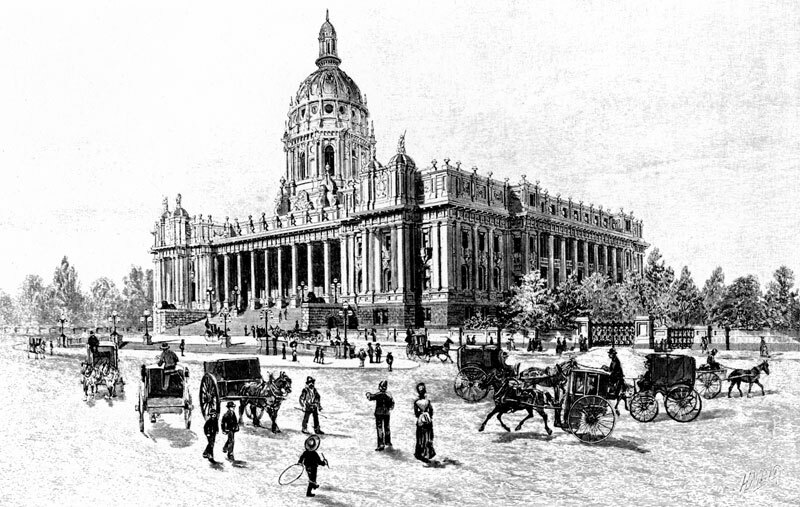 It is interesting to note that back then it was common for artists to draw completed buildings instead of the actual incomplete structures such as St Paul's, Parliament and the GPO. 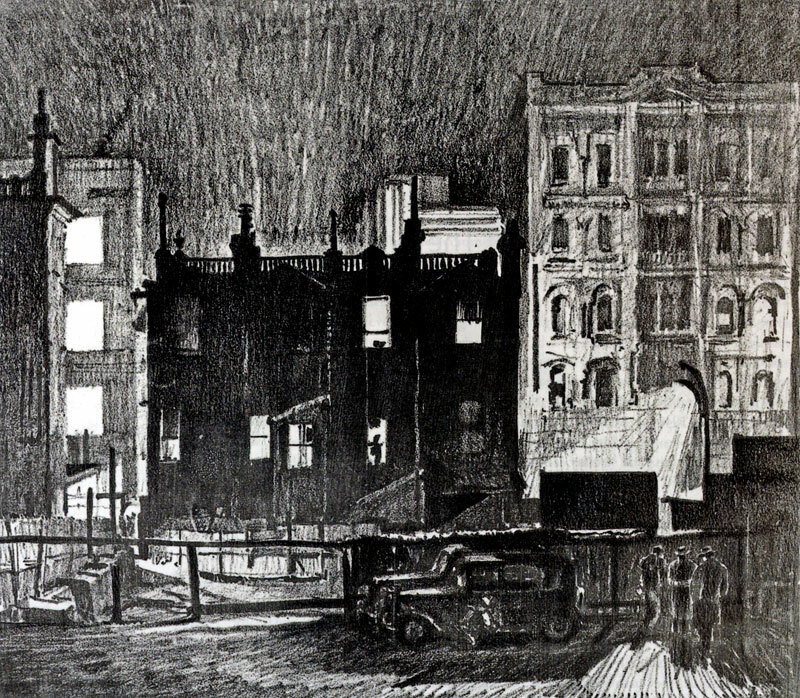 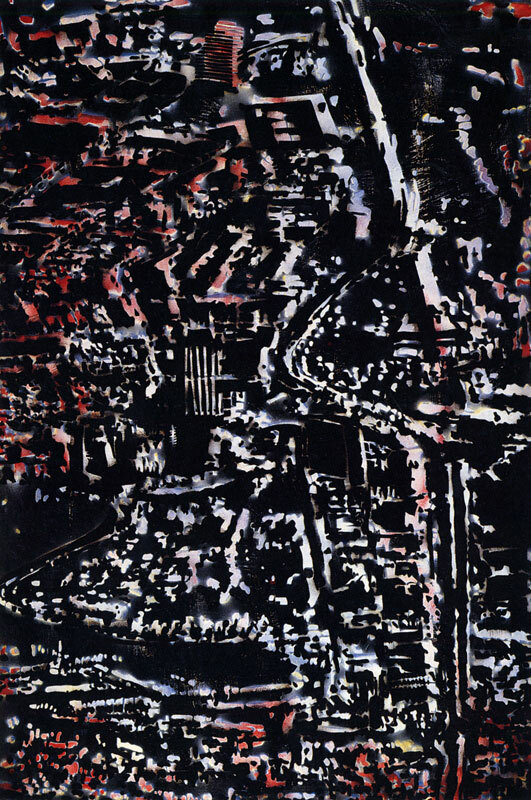 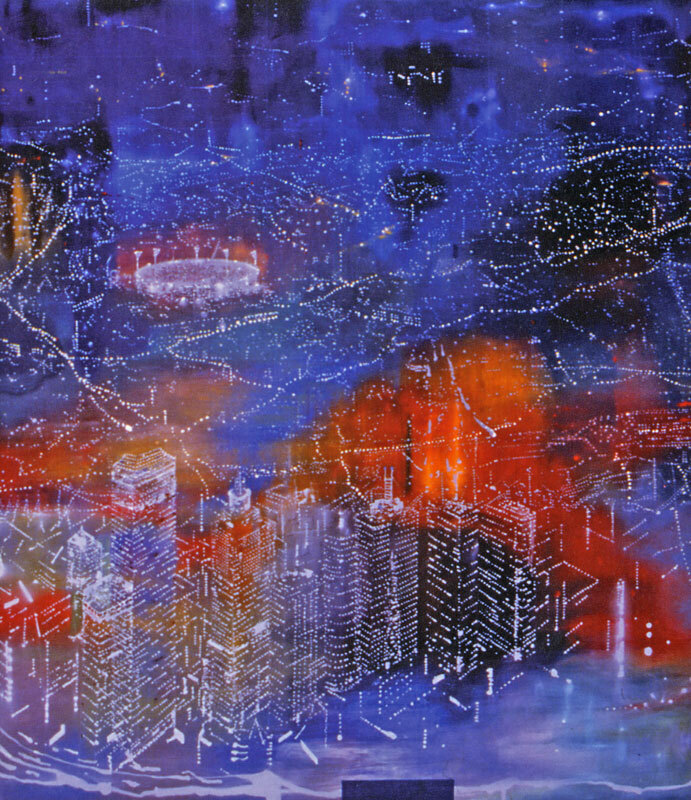 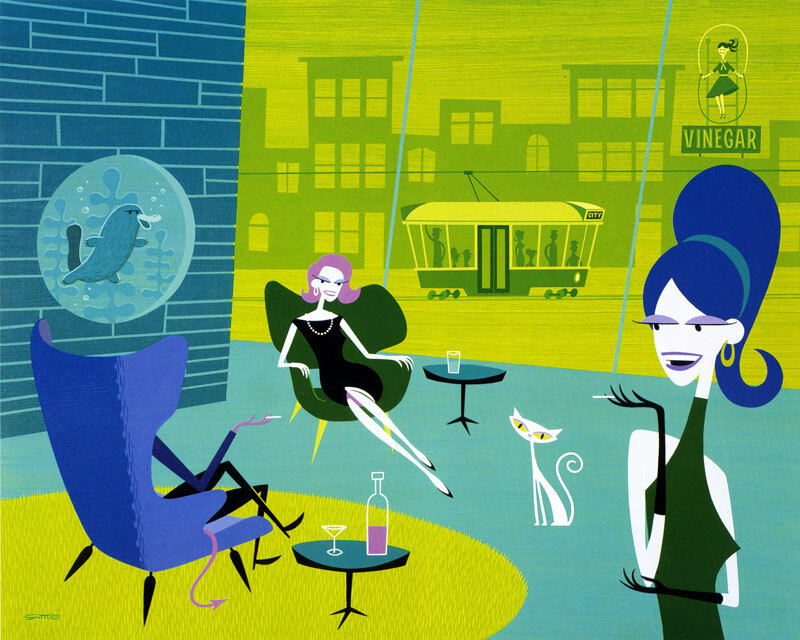 Harold Freedman, lithographs completed in the years 1962 – 1963. 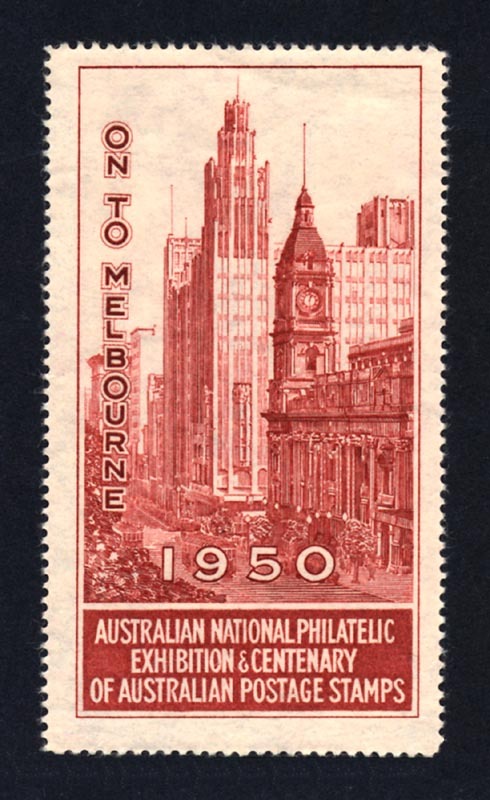 How good does Collins Street look in this promotional stamp? 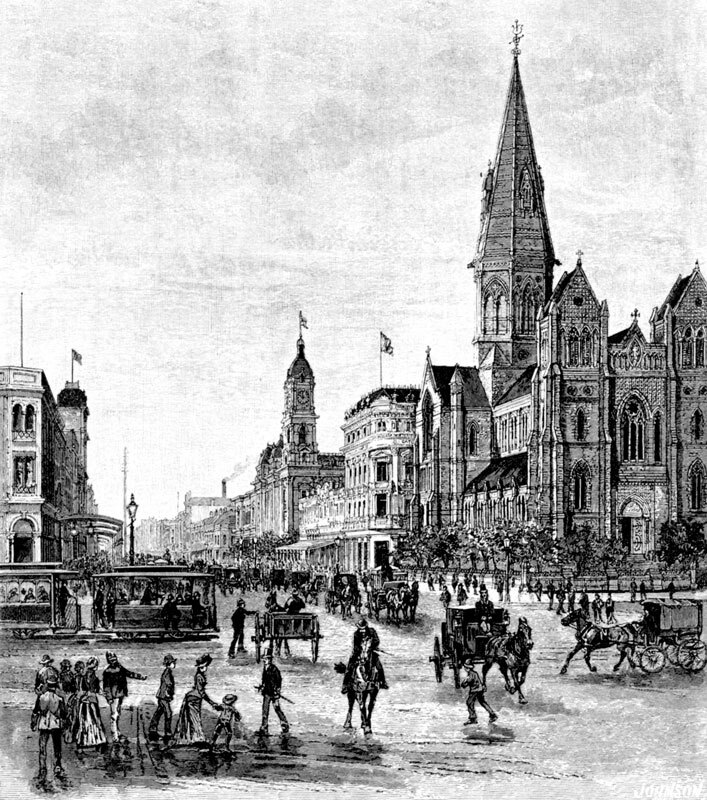 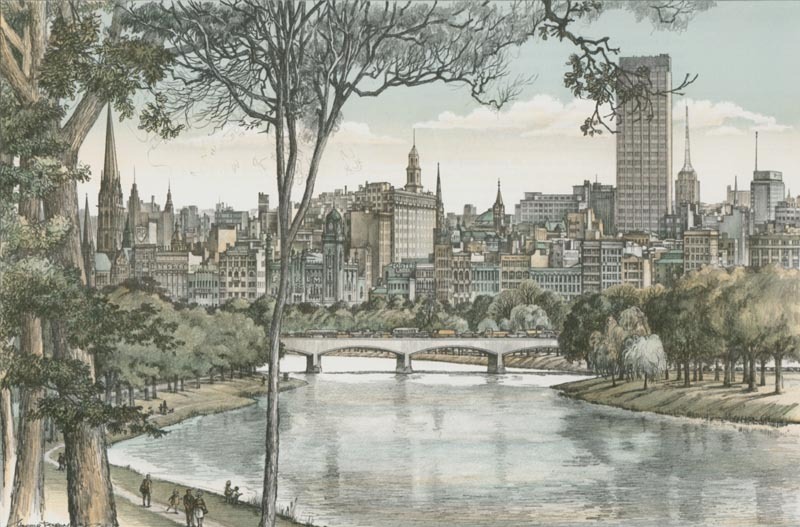 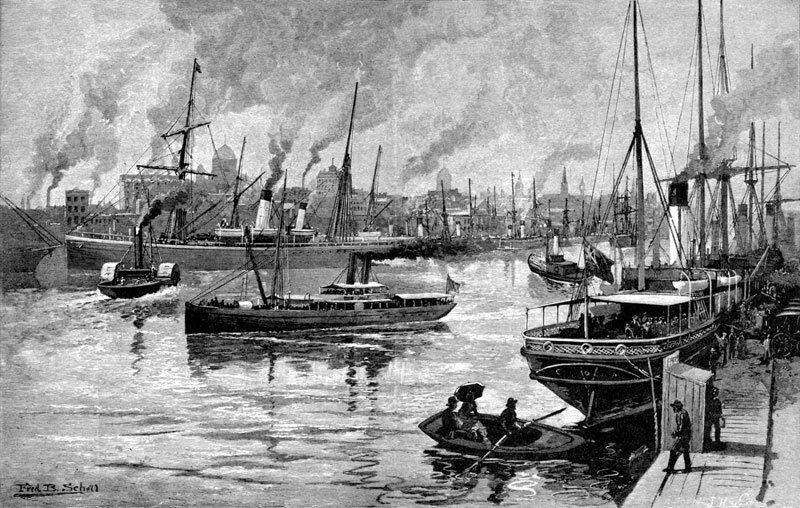 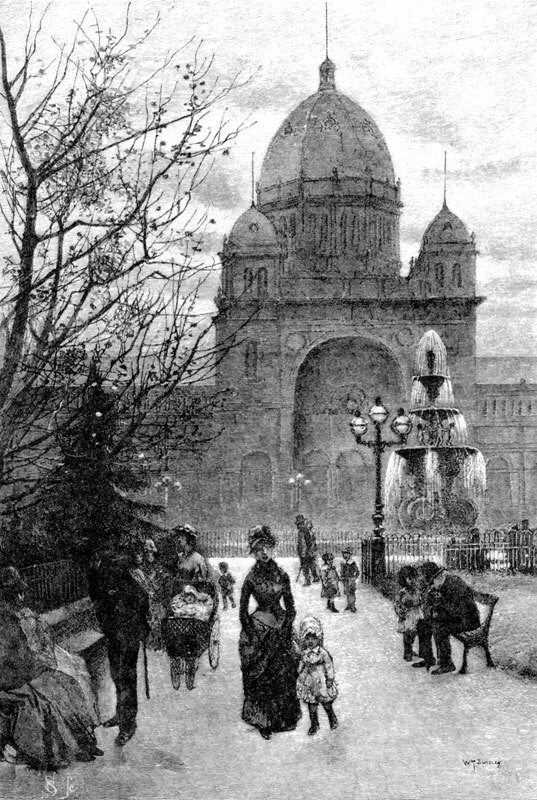 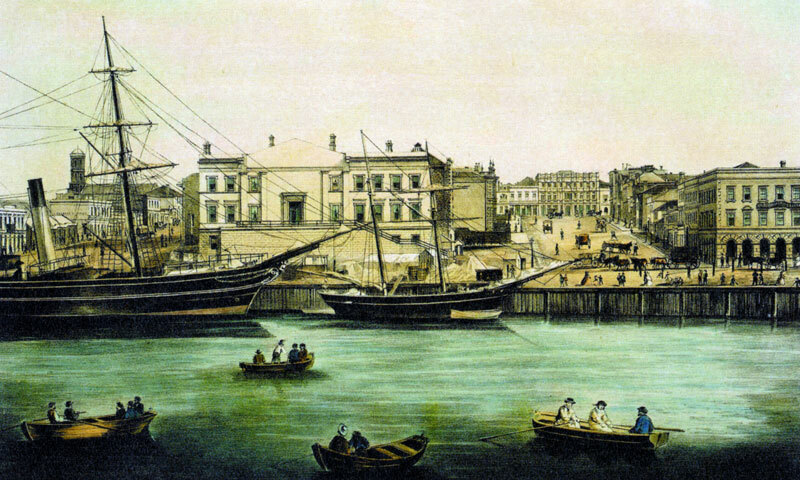 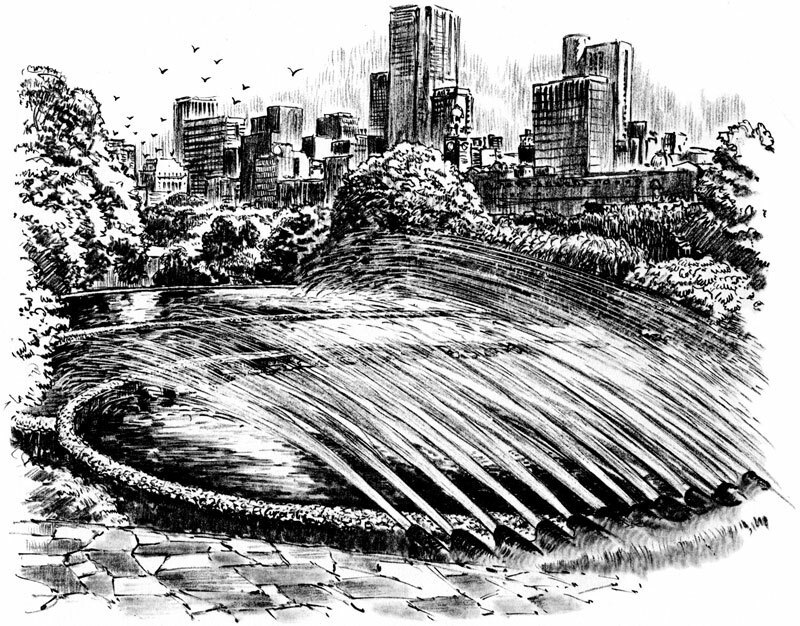 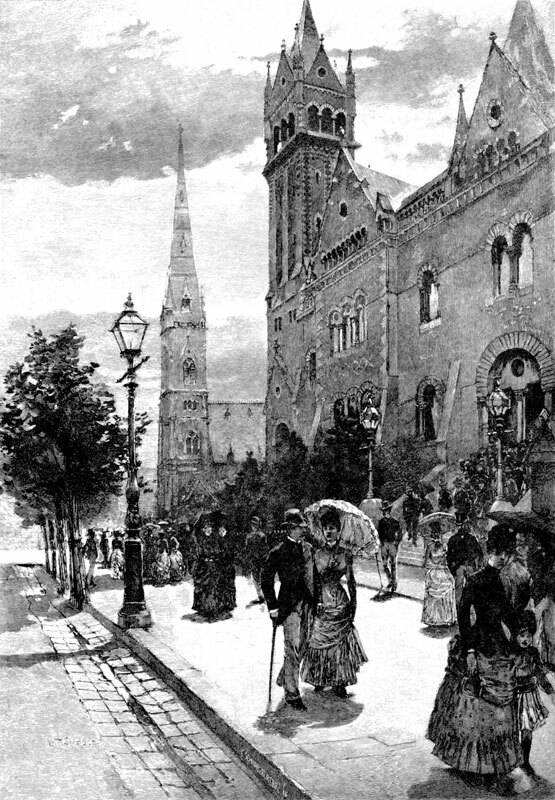 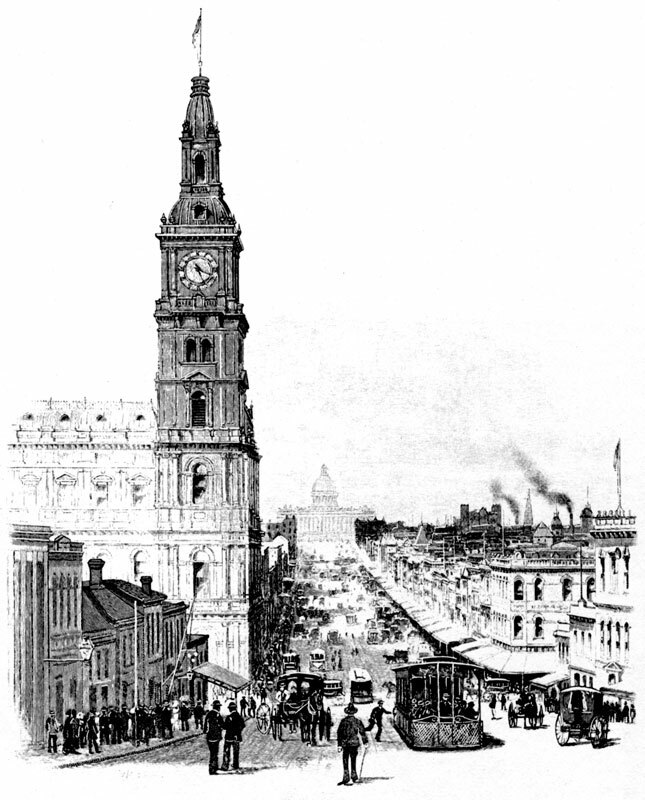 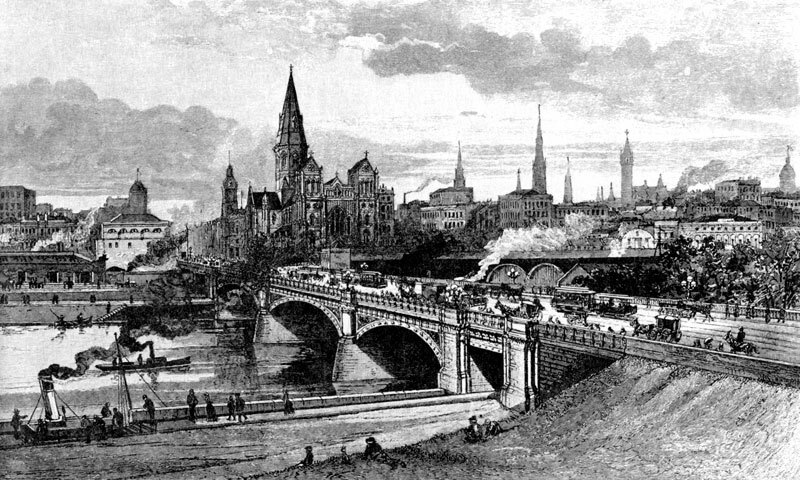 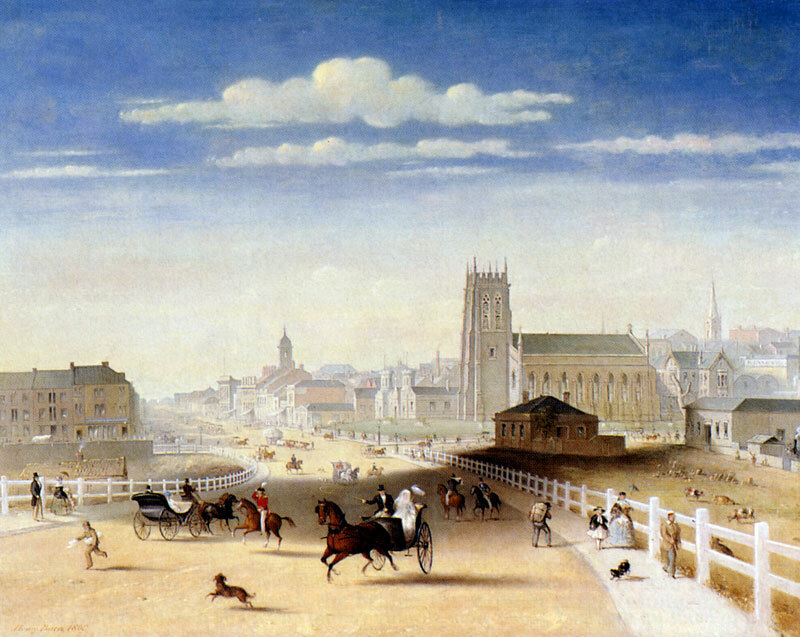 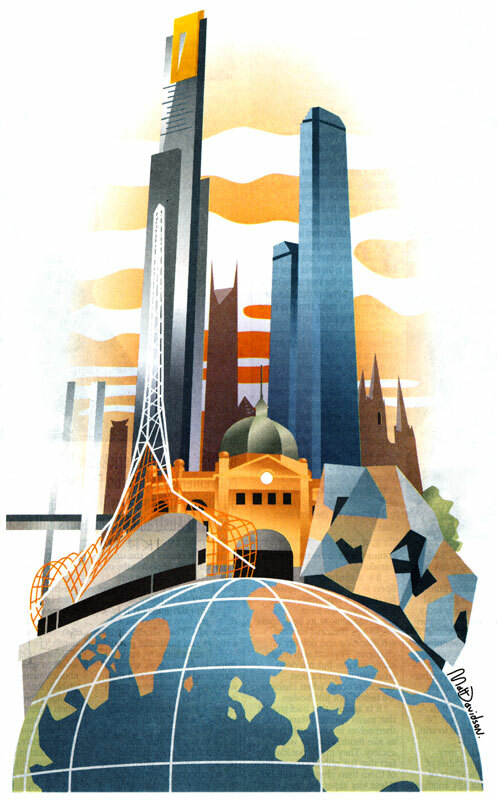 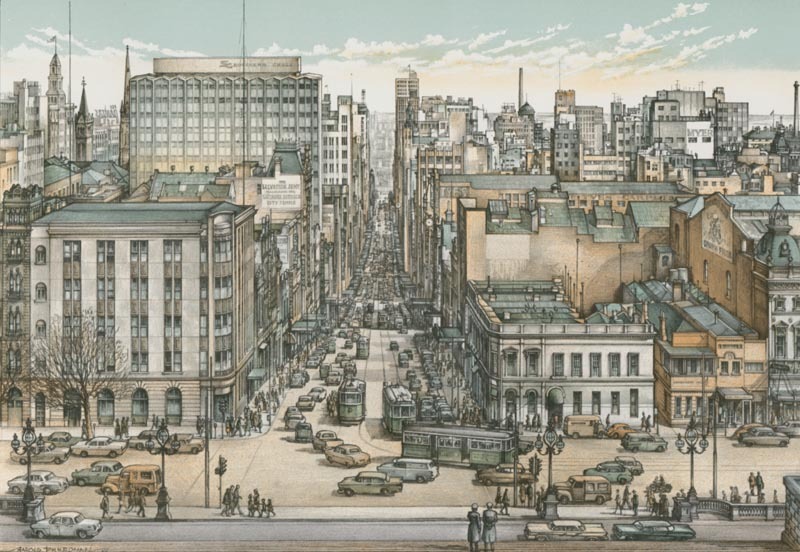 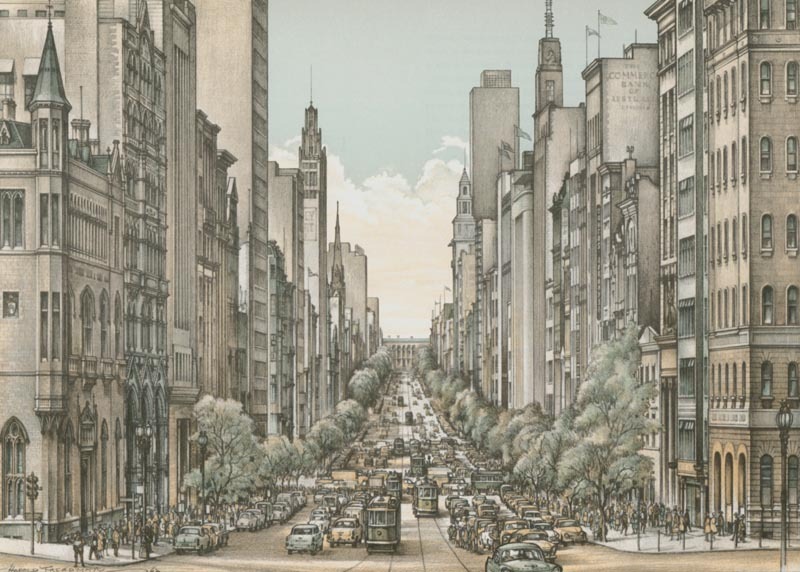 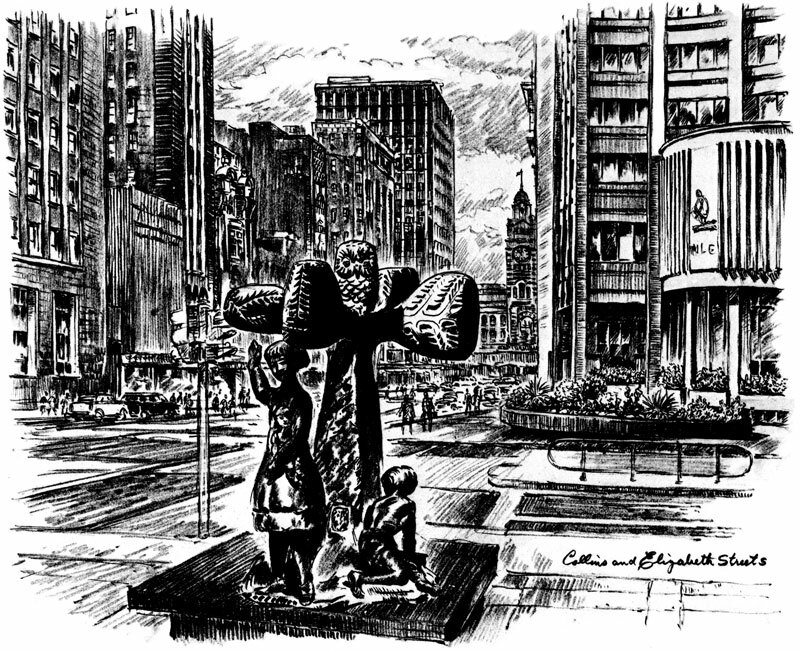 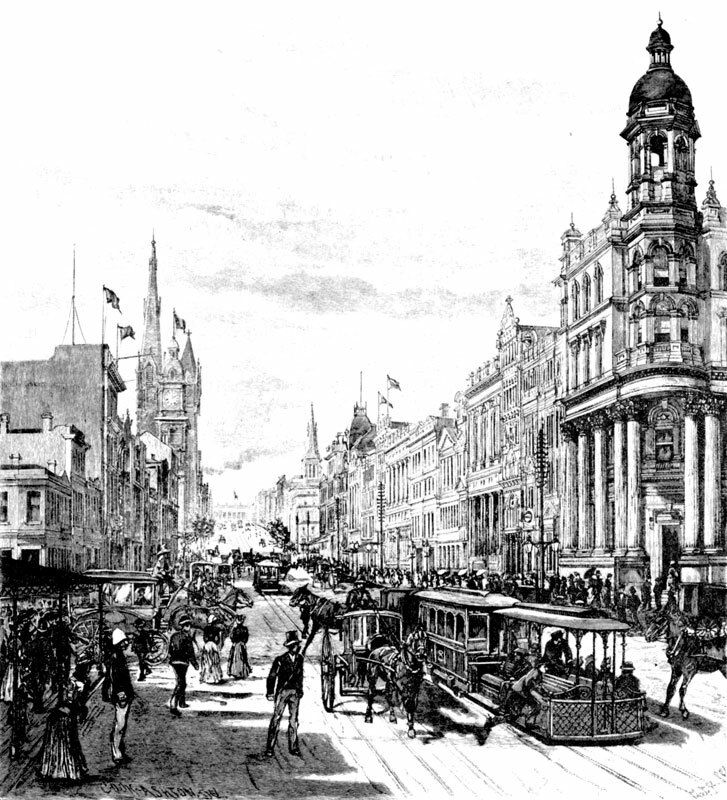 This stylized sketch of Melbourne was created for an Age newspaper article. 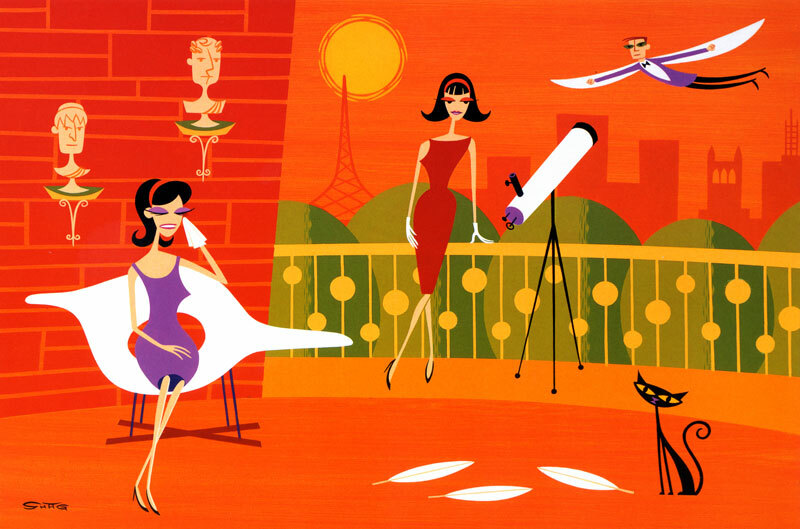 Love the fact that at least seven of our modern icons have been featured. 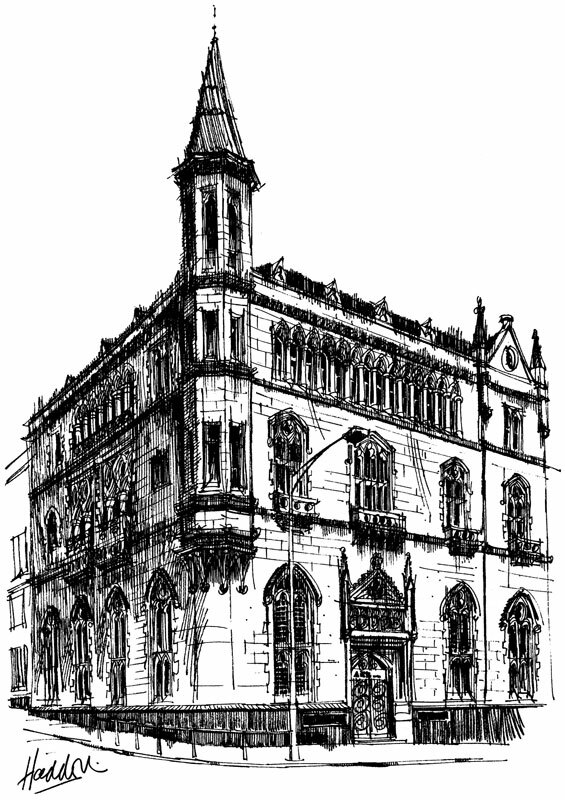 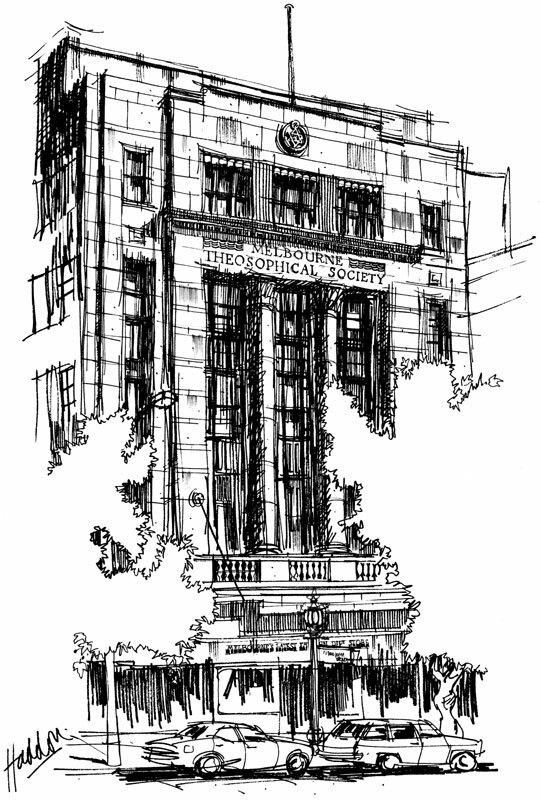 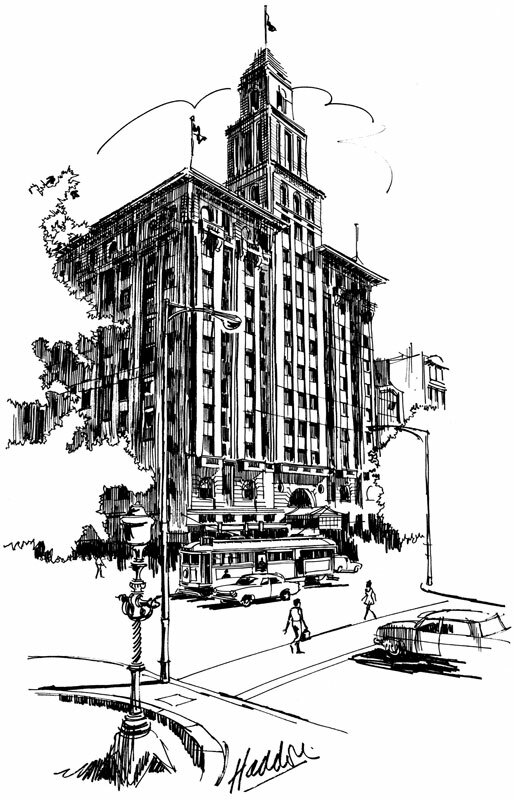 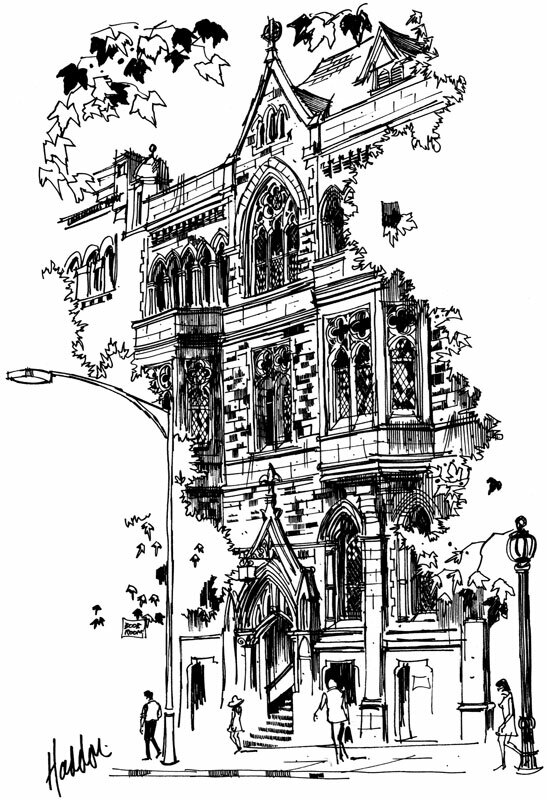 The next five sketches are from Cedric Emanuel’s Melbourne Sketchbook. 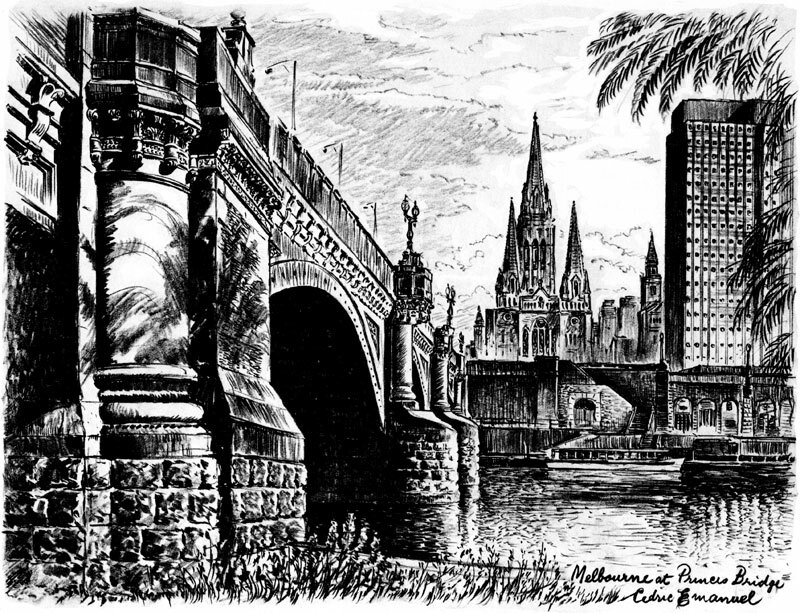 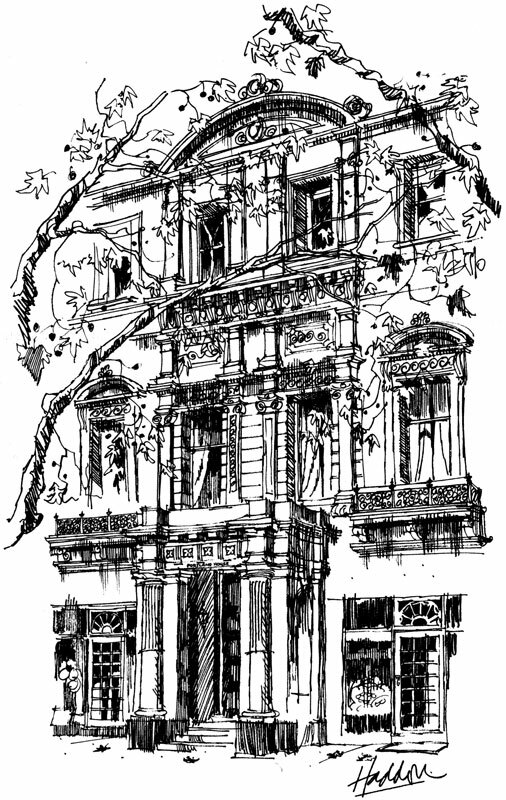 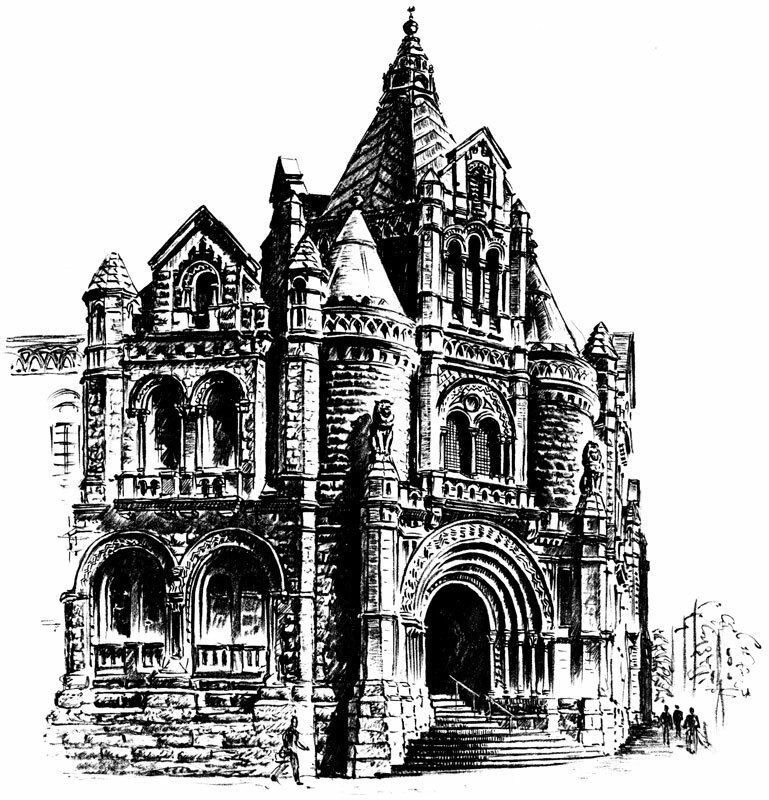 The next six sketches are from Historic Melbourne sketchbook. 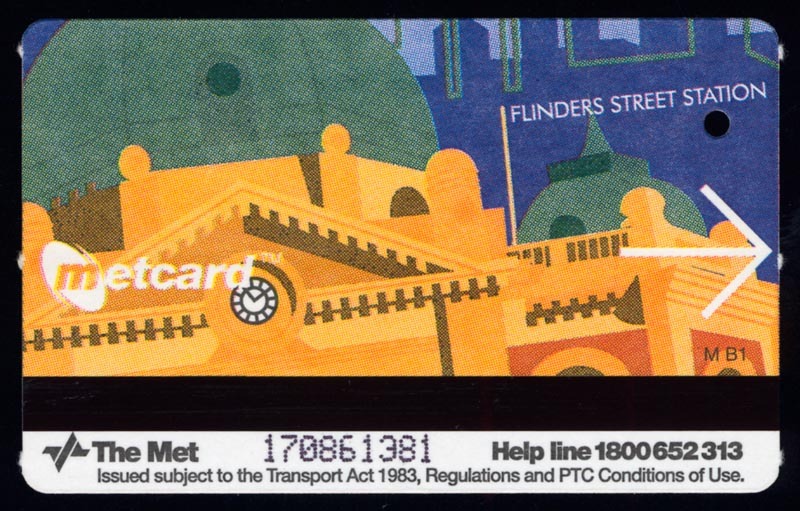 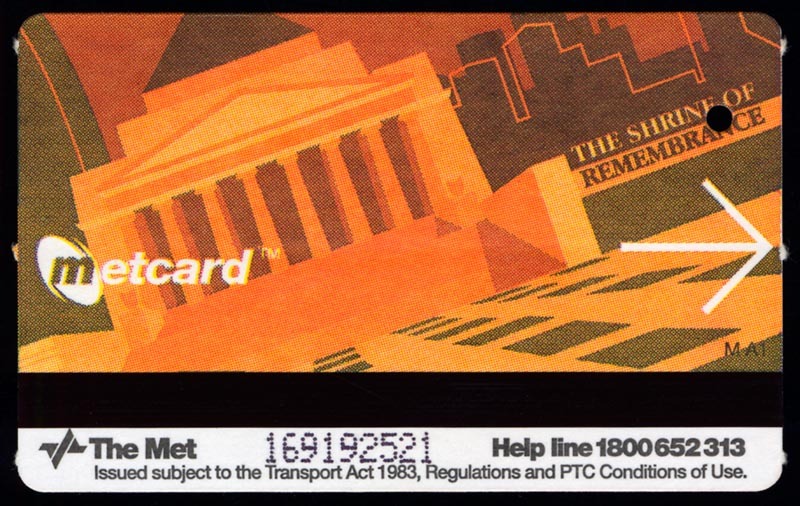 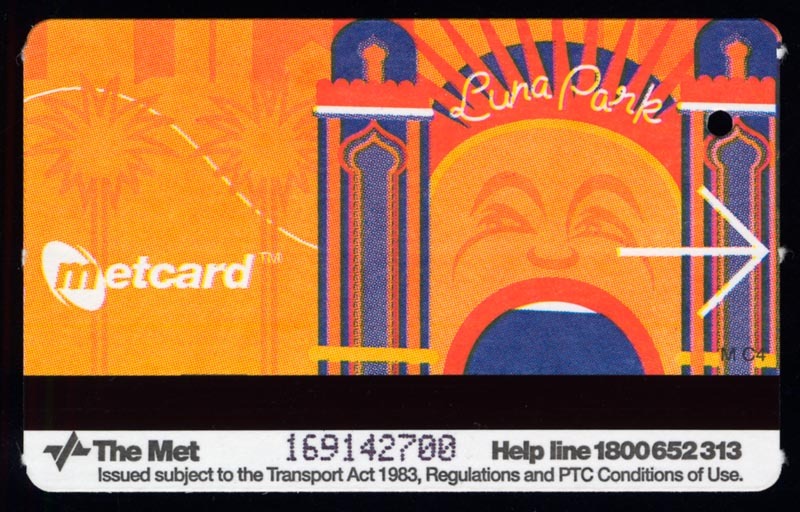 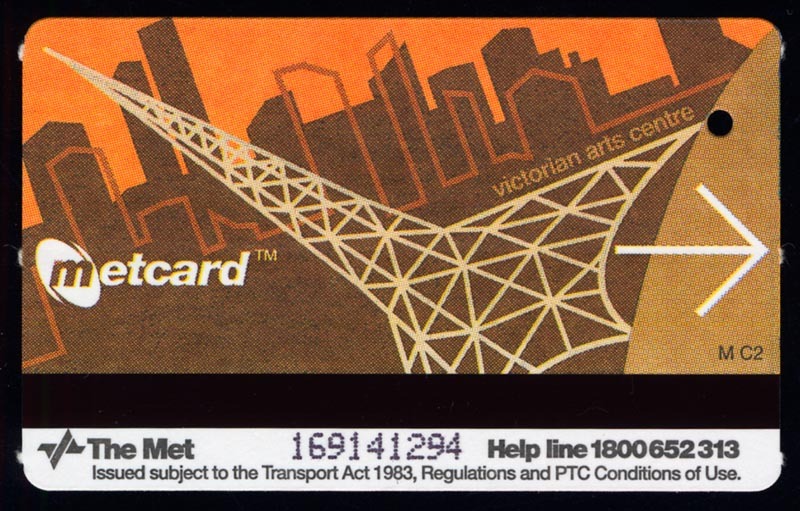 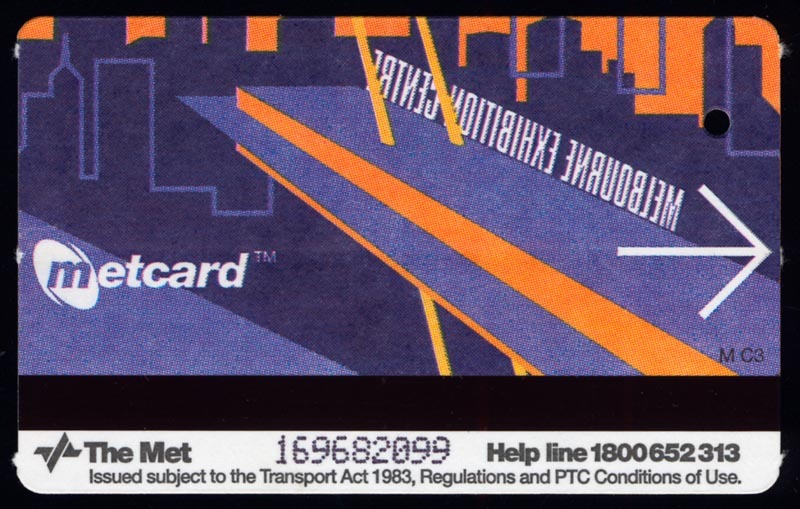 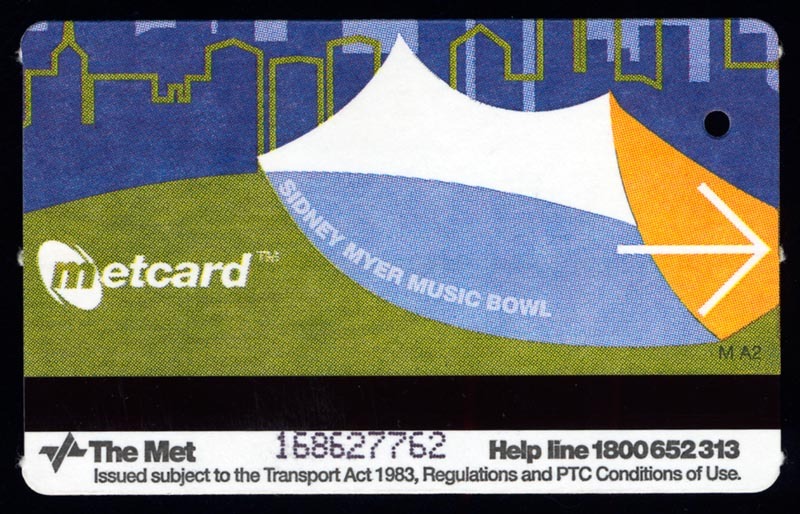 Melbourne architecture on Met tickets. 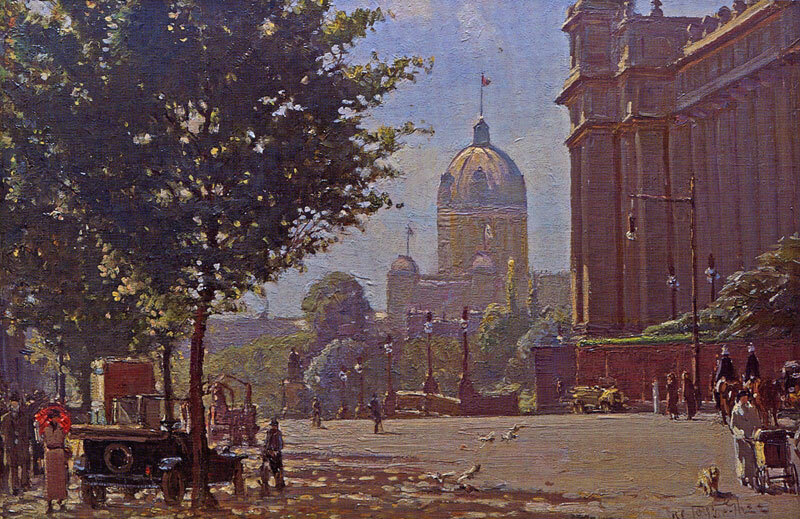 Cowen Gallery at The State Library of Victoria. 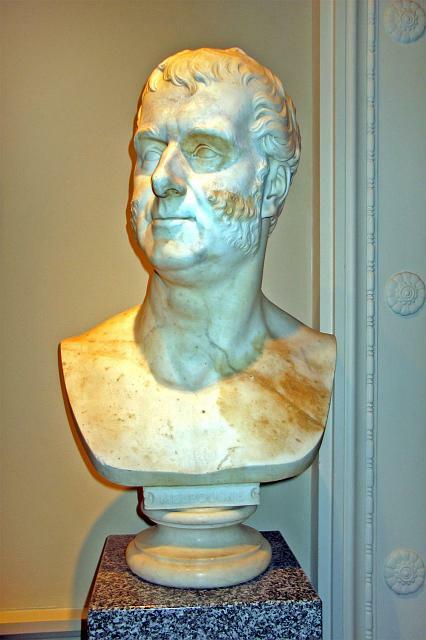 The main hall in the Cowen Gallery features views of Victoria and Melbourne, as well as important representations of the exploration and settlement of Australia, these works include historically and culturally significant works such as William Strutt's Black Thursday, 1851 and a colossal head of Lord Melbourne (as seen below).